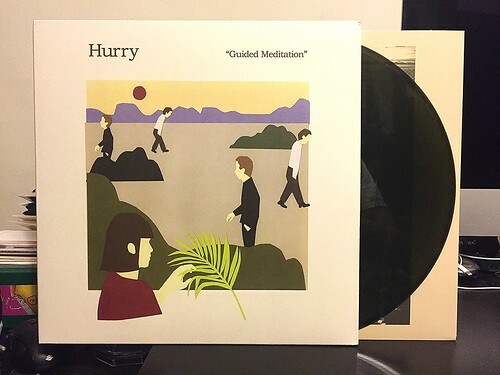 I had picked up Hurry's last record from 2014 called Everything/Nothing. It was a solid record that I enjoyed, though it never really entered the discussion for best albums of that year or anything. It was just a good listen for a change of pace. Fast forward to 2016 and the band has released their next album, this time on Lame-O records. Suddenly, Hurry is a band that is definitely standing out from the pack. I've always been a sucker for shimmering, breezy guitar pop. Throw on a Posies or a Beezewax record and I'm a happy guy. Find me one of the more upbeat Pernice Brothers songs and I'm pretty content. These are the feelings that Hurry is channeling over the course of Guided Meditation. I wouldn't say it's the perfect summer record or use one of those cliche's as there is an underlying strain of melancholy that hangs on each song. The harmonies are spectacular and really get stuck in your head, but they seem more rooted and less like throwaway melodies as they have a certain level of gravity that you don't hear too often. Maybe I'm the sort of person that does like a little more fire in my music and I probably lean towards bands playing faster in general, but there's something to be said about a band's ability to create an album this strong. All in all, this is a big step up for Hurry. With Guided Meditation they've crafted a pretty close to perfect pop record.